Werner bitterly complained about everyone involved in the official investigation. Even the American Vice Consul in Tientsin was found inadequate. (ii) "Do not this", "Do not that" will never carry a nation far from its own dunghill. 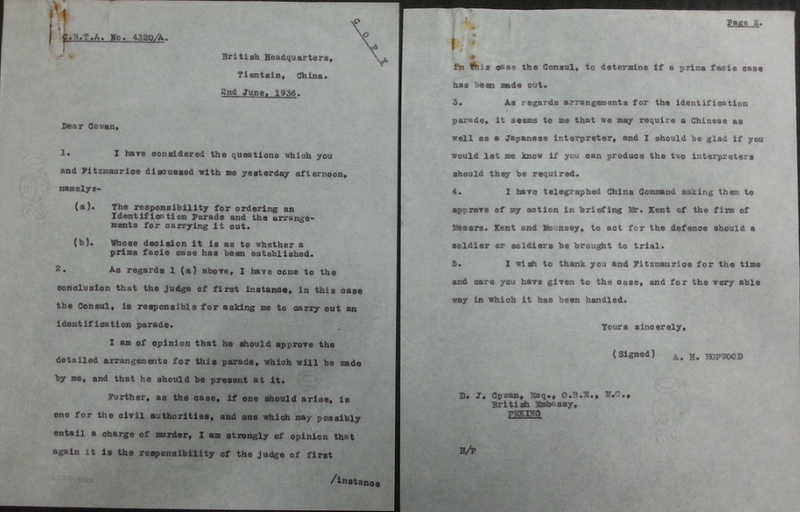 It is necessary first to refer to a case which occurred in Peking in 1936, when a drunken soldier was charged with murdering a Japanese subject, and after trial without jury was acquitted by Consul Fitzmaurice, acting as Consular Judge. Practically nothing was permitted to be published in the press regarding this case, the utmost secrecy being observed, and it was impossible for the public to judge whether the Consul's decision was, or was not, in accordance with the weight of the evidence produced. The Japanese military and civil officials who were present in court strenuously maintain that it was not. They assert that the trial "was not conducted seriously", that the evidence presented warranted conviction...and that justice was deliberately and purposefully withheld. It is debatable whether the reported opinions actually came from Col. Han or from the Japanese, as Werner had a long history of confabulation or invention. Werner admitted to talking with the Japanese, but this is overlooked in Midnight in Peking , and he escapes being called a traitor/collaborator. Werner admitted he wasn't present at the trial but his lack of information does not stop him accusing the consuls of grossly mismanaging trials due to an ignorance of the law and judicial procedure. Creighton, Assistant Chinese Secretary in Peking, was an eyewitness to the case, and his comments (below) are illuminating. Furthermore, additional archive material regarding the handling of the Sasaki case is found below. It refutes Werner's aggressive and unfounded statements about Fitzmaurice. Werner freely libels Fitzmaurice but fails to recall his own past judgements (Werner-Lyons, for example, in which Werner accuses, tries, and convicts). Despite his much vaunted training in law, Werner appears to have had no idea what would constitute evidence in a criminal case. Werner would have been a liability to the official investigation due to his own "gross blundering". At no point in his life does Werner ever show any self-awareness of his own inadequacies. Midnight in Peking omits such detail and accepts Werner's view of proceedings as the truth.